Yossi Milo Gallery is pleased to announce an exhibition of color photographs by Nicholas Prior. The exhibition will open on Saturday, May 14, and close on Saturday, June 11, with a reception for the artist on Saturday, May 14, from 6:00 to 8:00 pm. This is Mr. Prior’s first solo exhibition in New York. Prior explores the subject of childhood as a continuously evolving social construction. 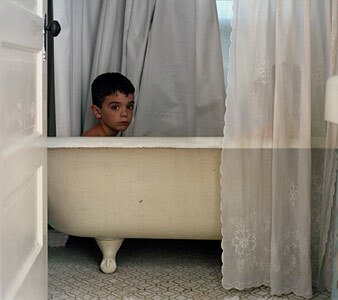 Set against deceptively benign New England environments, the photographs examine the loss of distinction between adults and children, reversing the commonly held adult conception of childhood as a period of innocence and simplicity. With adults noticeably absent, obscured or relegated to the background, Prior focuses instead on the fashions, mannerisms, technologies and rituals that function as trappings of adulthood. More than just harbingers of what is already their destiny, these adult artifacts and artifices have become assimilated and recontextualized by children. Exploring the emotional space that children create for themselves, Prior captures children’s attempts to define individuality through, and often in spite of, their surroundings. The resulting photographs reveal a vision of childhood in which the depth and complexity of the adult world are contained. Nicholas Prior was born in New York City in 1966. He holds an MFA in Photography and Related Media from the School of Visual Arts in New York City, where he currently teaches. Prior’s work is included in the Musée de l’Elysée’s eagerly awaited international exhibition “ReGeneration: 50 Photographers of Tomorrow”, which will begin in Switzerland this June and travel internationally. A book of the same title is being published by Thames and Hudson and the Aperture Foundation.